Here is the Calder leather on carbon fiber laptop case with suspension system fitted. We use two densities of foam in the block around the laptop - a high density foam to hold the laptop firmly and a lower density foam round the outer edge which creates a crumple zone to absorb impact shock. The suspension unit is removable to provide more space inside the case when not carrying a laptop. 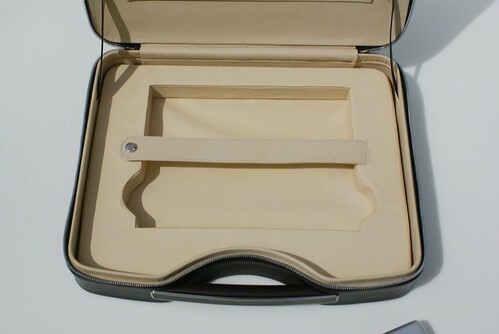 The case is large enought to provide good protection to laptops up to 1' 2" x 10" (36cm x 26cm). The suspension will made to order to fit client's laptops. There will be more photographs on our website soon. I'm Aen whom you read about over at designsojourn. I'm interested in the Calder laptop bag and I wish to find out the price of the beauty. I'm really liking the simplicity of the build and look. I'm from Singapore and you can contact me at aen@aendirect.com. By the way I have a new article on Yugen if you're interested. Aen thanks for writing, I'm glad you like the case design. You can see more pictures and full details of all our cases on the main Calder website. 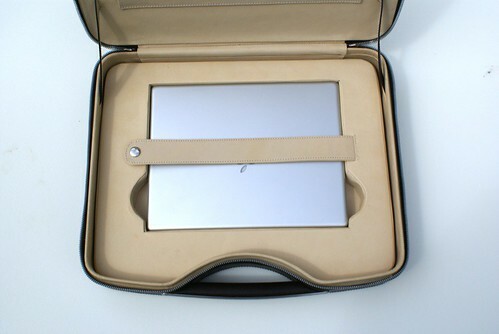 Our cases are made to order and the price of the laptop is £2120. It's out of my reach, but nonetheless I'm going to write an article about these bags. I'm absolutely compelled to recommend this to anyone who might just be looking for them. I am delighted and grateful that you want to write about our cases. I enjoy your website and hope that with your strong interest in Wabi Sabi you will write something about the thought that has gone into our designs.